It's been about a decade now since Lian Neeson enjoyed a rebooting of sorts for his career, in which he took on the grizzled, quietly trained yet semi-retired persona of Bryan Mills, whose "particular set of skills" as an ex-CIA officer helped him locate foreign human traffickers who took his daughter. Since, he's unabashedly shaped his career around variations -- some subtle, others significant -- of this specific character type, especially under the direction of Jaume Collet-Serra, who sent him on an automobile chase in Unknown and on a plane in Non-Stop. What's left out of that equation? Putting Neeson's revamped hero persona on a train, of course, which the director has done with The Commuter, taking place almost entire between several cabins barreling down New York's public transit line on a pretty average day. Fatigue may be starting to set in with Neeson's repetition of similar heroic performances, but that isn't the only spot where Collet-Serra's oddly convoluted thriller flies off the rails. This time, Neeson plays an ex-police detective, Michael MacCauley, who has transitioned to selling life insurance for something more safe and secure for his wife and college-bound son. Whole on the train ride home after a particularly tough day, complicated by emergent financial problems, MacCauley gets approached by a woman (Vera Farmiga) who strikes up a casual conversation about the social aspects of observation. What begins as a playful "experiment" between them evolves into the mysterious woman -- not a regular commuter on that particular ride -- offering MacCauley $100,000 to use his deduction and make a vague decision about the fate of one of the passengers, after the ex-detective to figure out who's the "right" passenger: the one who doesn't belong there. Moral uncertainty makes MacCauley second guess whether to do it, which leads the blond woman forcing his hand, creating a mystery for him to decipher and decisions to make about what to do � and who's trustworthy on the train. 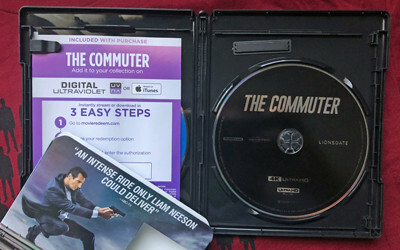 Jaume Collet-Serra kept his previous Liam Neeson vehicles from dealing with too many of the symptoms of "been there, done that", but The Commuter doesn't pick up the speed to get this done, never fully getting away from the sensation that it's "Non-Stop On a Train" with the secrecy built around the ex-detective. There's a spark of novelty in the editing and structure of the film's beginning, showing the repetition and monotony of time passing in relation to MacCauley's daily train rides and the people with whom he interacts, underscored by his banter with the always-reliable Johnathan Banks. The ways MacCauley adjusts to the situation created by the woman's proposal fall into those of an active member of law enforcement, the only difference being that the ex-detective's morals and financial desperation could, in theory, sway his decision-making. Collet-Serra squeezes genuineness into how details are indirectly revealed about MacCauley's life instead of through point-blank exposition, but regardless of those efforts, it's just camouflaging another trapped, trained pro sleuthing through confined transit cabins. The key difference separating The Commuter from some of Neeson's other action-thriller endeavors lies in the moral dilemma posed to MacCauley, in which he's given the opportunity to locate the right person on the train using his particular set of skills and receive a hefty payday for his efforts. Along with some Hitchcockian vibes, it's an echo of the thought-exercise presented by Richard Matheson in his short story "Button, Button", only instead of the ex-detective pushing a button to kill a stranger in exchange for money, he'd need to do some footwork in choosing the right stranger and marking them for un undisclosed fate; the assumption, naturally, is that the selected person would wind up dead. 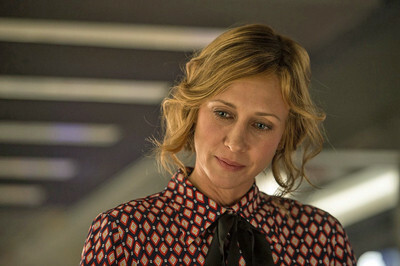 The creativity involved with breaking down and restructuring this premise around the ex-detective gets overridden by the nonsensical moving parts of the scenario, engineering an elaborate scheme so that Vera Farmiga's character and her employers remain hands-off from responsibility. They have a firmer grasp on who their target is than MacCauley, so making him jump through the hoops -- instead of just hiring a hitman -- appears intentionally contrived. 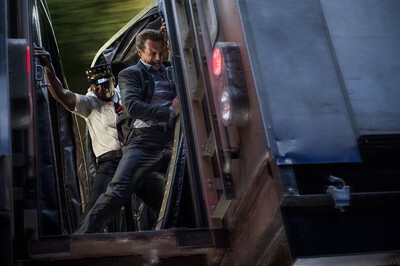 Can Liam Neeson save the day in The Commuter, both literally and figuratively? Not with quite the energy and physicality from a few years back, but he still brings enough of his statuesque and weatherworn appeal to MacCauley to enjoy that aspect of the ride, adding sturdiness to a handful of obligatory hand-to-hand brawls and moments of peril built around him staying on the train. The script relies on a mosaic of characters to reinforce the suspense of the ex-detective's sleuthing, though, where the passengers must have some identifiability and/or suspiciousness, and that's what proves to be a challenge for first-time screenwriters Byron Willinger and Philip de Blasi. They leave it to the variety of commuters to cope with the cumbersome exposition from which Neeson was (mostly) spared, from a mistreated girlfriend defending her boneheaded man to an obnoxious upper-crust stock broker and a twitchy musician, and the script's halfhearted attempt at a community bond between the everyday commuters gets derailed by the overtness of the outsiders, clearly pawns in a mystery. Despite the messiness of the premise, there's still a streak of curiosity behind who the chosen passenger will be and why they've got a target on their back, which The Commuter does eventually reveal in its chaotic final act full of anticipated action-movie bluster involving high-speed trains. Too many short-lived red herrings and certain unconvincing moments in the performances leave the plot without many interesting directions it could take, and the revelations about the intended target of MacCauley's moral dilemma are as convoluted as they are clumsily tied to contemporary issues involving mistrust in law enforcement. Fact of the matter is, Neeson still knows how to entertain an audience while embodying this type of older, seasoned badass persona that he's discovered late in his career, and while The Commuter doesn't reach the same heights as his other collaborations with Jaume Collet-Serra, it's still worth sticking it out until the end of the line to see how this version of his archetype attempts to pull this thing back on track. 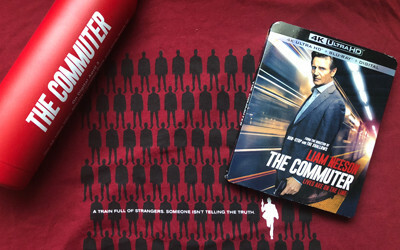 The Commuter rolls into the home-media station in a fairly standard two-disc presentation, contained in a black case housing the deep-blue 4K UltraHD disc and the brighter blue Blu-ray as Disc Two. A curved-edged cardboard sleeve with a slightly metallic shine duplicates the front and back images, and a Digital Copy slip can be found in the inner flaps. There isn't a lot of variety to the visuals of The Commuter, since most of the shots transpire within the confines of the train cabins: the monochrome walls, the metallic accents, the light pooling in from the windows as they look onto the passing scenery. The photography also latches onto that contemporary color timing hinged on heavy teals and oranges, which only gets elevated by the colorless nature of the train's aesthetic and the density of people present throughout. Ton a technical level, the 2160p 4K presentation from Lionsgate is stellar. Underneath a veil of digital grain, skin tones discover enough convincing natural color to shine alongside the warmer orange-tilted colors, while the pooling of light on the somewhat dark public-transportation walls yields fine blueish-green leaning shades with no perceptible banding. Contrast skews a tad dark, at times limiting visible details whenever the cabins aren't well-lit by outside sources, but it also enhances depth and elevates the sharper glimmers of light -- on metal and leather accents of the seats -- through measured HDR punches here and there. Detail is exceptional in close-ups of skin and garments, but perhaps not remarkably more so than a standard high-definition source, though text and textures at a distance are exceptionally satisfying. This isn't the most absorbing visual experience, but The Commuter's 2.35:1-framed image does look good in 4K. The Dolby Atmos track share a few things in common with its visuals: since the location changes so infrequently, and since there isn't a whole ton of activity while Neeson's character is sleuthing around the other passengers, there isn't a wide variety of elements in the sound design. Therefore, it's up to the track to capture the distinct atmosphere of riding on a train, and the object-based track stays stable from start to finish, capturing the screeches, rattles, hums and whooshes of the experience with capable responsiveness from the sprawl of the channels. More notable sounds like the clanking of bags, the snap of ticket hold-punchers, and cellphones ringing are punchy and responsive to higher-end crispness, while the swoosh and slam of cabin doors and the thump of bodies on the leather seats hit convincing lower-end ambient notes. Dialogue is impeccably clean and discernible, if running on a slightly lower registry than the atmospheric elements, and the handful of action-movie bursts in the film -- a few hand-to-hand fights and a little added explosiveness in the final act -- telegraph firm yet unostentatious bass levels without any unconvincing rumble. Spanish and French language 5.1 Dolby digital tracks are also available, along with English and Spanish subs. As a pleasant surprise, The Commuter arrives with the same pair of extras on the 4K disc itself and its standard HD counterpart. End of the Line (9:15, HD) takes a pretty standard approach to the press-kit featurette, packing together interviews and behind-the-scenes shots with clips from the film. The filmmakers discuss duplicating the New York train atmosphere at Pinewood Studios in London, how many of the actors were native to the UK, and how Liam Neeson shares some similarities to John Wayne. The other, Off the Rails (4:18, HD), delves into preserving tense atmosphere within a train and adjusting to modern "demands" for action movies, as well as how so much of the more intense elements were simply created from scratch. 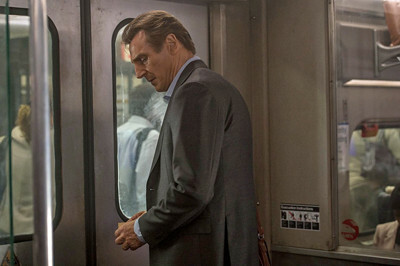 A passable action-thriller with a few surface-level headscratcher elements, The Commuter sits on the lower end of Liam Neeson's latest crop of cinematic outings focused on a gruff, well-trained older protagonist who employs his skills to fix harrowing circumstances. After tackling globetrotting manhunts and high-altitude suspense on a plane, he's now hopped on the public-transit line for a moral dilemma that leads to something between a cat-and-mouse and whodunit thriller, in which his everyman status conceals an ex-detective who's more that capable of decoding who does and doesn't belong on his day-to-day train. It's too laboriously contrived to stay invested in the actual mystery, but seeing Neeson's character do the mental work and charge into peril where needed still has its moments of fun. Lionsgate's 4K disc looks and sounds quite smooth, and comes with about fifteen minutes of extras for something to digest after the ride. It's worth the trip, but probably only as a one-way. Rent It.